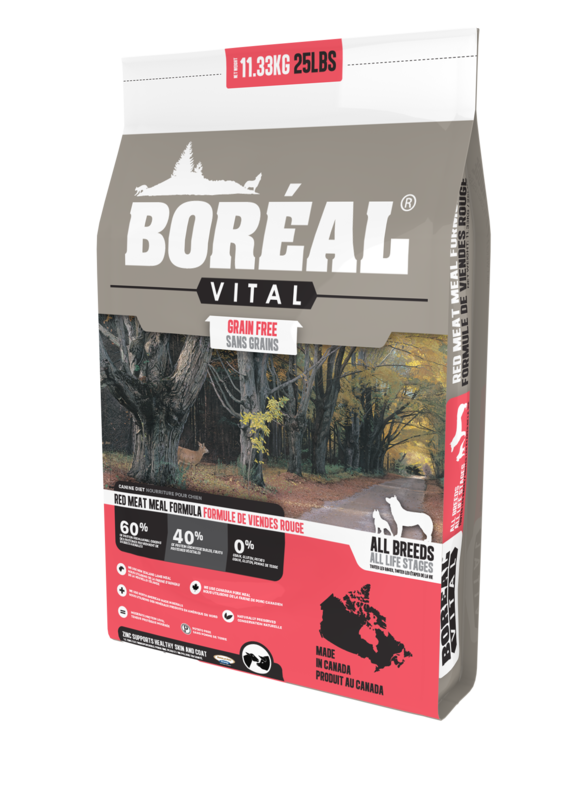 Boréal Vital Large Breed Chicken Meal is a grain free diet with a limited ingredient list and single source protein. 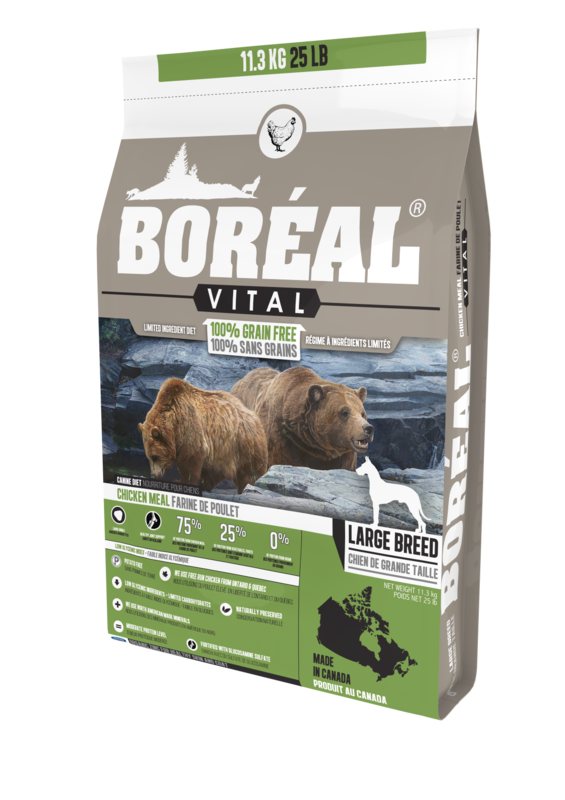 Designed with large breeds in mind – we use a large kibble size, have a moderate level of glucosamine. This is an everyday diet which can be used to help keep weight off your dog as well can be used as a hypoallergenic formula. Using a core of beans and peas to replace the grains found in many dog foods, our low glycemic index ingredients will help keep a dog feeling full longer after they eat. We use free run chickens grown in Ontario and Quebec. This is a diet for all life stages and is grain and gluten free. Naturally preserved, we use Availa®-Pet from Zinpro Performance Minerals® and add Availa®-Zn, an organic zinc that will help skin and coat conditions, especially with Northern breeds. Chicken Meal, Peas, Northern White Pea Bean, Chicken Fat (Naturally Preserved with Vitamin E), Lentils, Pea Protein, Brewers Dried Yeast, Beet Pulp, Green Peas, Flaxseed, Natural Liver Flavour, Potassium Chloride, Taurine, DL-Methionine, Dried Apple, Dried Carrot, Salt, Iron Amino Acid Complex, Zinc Amino Acid Complex, Vitamin E Supplement, Copper Sulphate, Folic Acid Supplement, Vitamin B12 Supplement, Vitamin A Supplement, Niacin Supplement, Selenium Yeast, Manganese Amino Acid Complex, Calcium Pantothenate, Riboflavin, Biotin Supplement, Vitamin D3 Supplement, Calcium Iodate. Note: We recommend puppies be fed all life stage diets before switching to a large breed food at 9 -12 months old.